Back To The Future written on Atari 8bit!? While watching this Back To The Future (1985) Retrospective (exact timestamp) today I noticed what appears to be an XE with an Indus disk drive being used by Bob Gale, co writer for the movie. The retrospective review mentions the original idea for the movie was Gale's. Thing is, the XE's came out in early '85 so maybe in this photo he's finalizing the script? According to that documentary the writing was being revised. Writing began in 1981 by Mr. Gale. If he had an XE in '85 time frame, perhaps he upgraded to it for the extra RAM while still using the same computer setup otherwise. The wiki page for the movie says filming ended April 20th, 1985. A reverse image search on that photo shows zero results. The detail in the photo is not enough for me to read the text to determine if he's revising the actual BTTF script. With an 80 column board and a laser printer? And the font looks off. Hm, the computer looks too flat and theres that black strip at the top or a weird shadow that makes it really hard to tell. Maybe? With an 80 column board and a laser printer? And the fint looks off. Hm, the computer looks too flat and theres that black strip at the top or a weird shadow that makes it really hard to tell. Maybe? What I see is definitely not a 80 column width, and why not a laser printer? 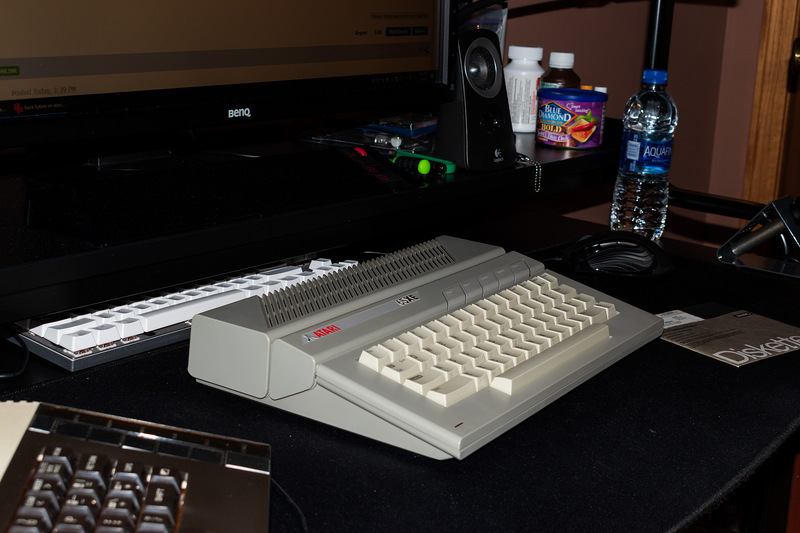 I have been using several laser printers with my Atari 8bit computer. Unfortunately the last one died last year, so now I am back on dot matrix. And are we sure it is a printer? It looks more like a personal copier. This is definitely a great find. Looks like Atari XE indeed. 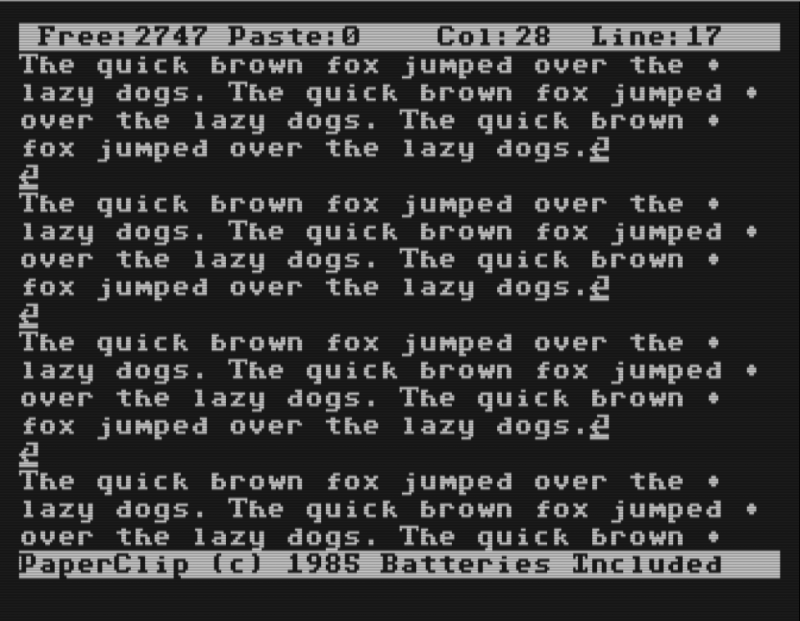 Even today the atari 8bit can do an excellent job as a word processor. Back in the day still typewriters were used (I remember the end pic of Stephen J. Cannell in the A-team pulling the paper sheet out of the typewriter and throw it in the air; ok this was just for the show, but it think it makes sense to think people find it pretty normal to see him writing on a typewriter). So more advanced people used a computer, and why wouldn't that be the amazing Atari 8bit? Shoot, I forgot all about that thread. That's not a black strip. That's how the grille on the XE looks when viewing it edge-on. I can reproduce that effect today. Edited by Sugarland, Sat Mar 2, 2019 2:50 PM. Oh wow!! Thank you! I did search 'back future' in this forum but the search feature here returns a lot of erroneous stuff. Edited by Sugarland, Sat Mar 2, 2019 2:51 PM. While it is an Atari that was used. Don't consider a writer using it out of the ordinary or abnormal. Many folks used Ataris. Atari- both the 800, xl, xe line and ST (and E) were used heavily in music in that era. Atari also made specific hardware for cinematic work and production. Sound and Graphics solutions. Much of it tossed, lost, or buried in with piles of props now. Edited by _The Doctor__, Sat Mar 2, 2019 3:30 PM. Photo attached. I have tried to reproduce the dark grille effect in the original photo. Note that my camera flash is much brighter than the one used for the photo, allegedly due to today's improved camera technology but that's highly debatable. What is interesting is that whoever took the photo was perfectly aligned to have the grille darkened to its most extreme. Any more up, down, right or left and it would not looks nearly as black. Wait, it's Saturday and I'm reproducing a 1980's Atari photo. This is my life. Edited by Sugarland, Sat Mar 2, 2019 3:46 PM. I don't understand your assertion. This was purely a writing purpose, not cinematic, production, sound nor graphics. The first is more than a iconic movie, it still is a pop cultural phenomena. The writing was a very big part of that success. I've never heard of a prominent or famous movie script or book written on an A8. Many writers were not even tech savvy back then. The printer in the photo is a HP Laserjet II, introduced in March of '87. So he was writing the BTTF sequels on A8 as well!! That's highly unusual and notable. Most computer users in '87 in this country were dreaming of upgrading to a 16bit machine (or a faster PC) if they hadn't already. IMO in the late 80's A8 was approaching rare status as a daily driver in the USA, let alone a work computer. PC's, C64's, Apple's etc were common yes... It's a safe assumption most writers didn't even use computers at home in the early 80's. Bob Gale got his first computer in 1980, which was an Atari 800 hooked up to a black and white television, one of the only home computers you could buy at the time, other than a Radio Shack TRS 80, nicknamed the "Trash 80." I like that he stuck with the platform for years. It worked for him, apparently. He was an early adopter and loved his Atari 8bits. Now there would be some good disks to get ATR images of. I would indeed continue using the same equipment as the material is still far easier to search and make sure continuity between the time lines is met. I also don't think folks give the writers much credit. There were many people using word star as well on c/pm and such systems. Scripts and screen plays were often done in this fashion, and with good reason. If you think it was all done in a notebook or on a bog standard typewriter... well okay then...but you live in a world more make believe than Hollywood. The fact I stated is not some strange assertion, everybody was excited by the technology and eager to use it. Whether it was a writer, a composer, a graphic artist, you name it. As each person came into contact with the tech. they too wanted to use it. Portraying writers as Luddites using a typewriter at best was the strange thing. The surprise at an Atari being used for this actually didn't make sense to me. Explaining what was going on around the people that interact in this case is a good way to show just how normal it was. I wasn't the least bit surprised. I found the incredulity expressed about it being used rather surprising though. Maybe A8's were more popular in California/Hollywood area than the DC Metro suburbs. Yes many writers avoided the tech here. Real fuddy duddy's. A close relative had a computer at work and typewriter at home. My learned impression was that adults would not buy a computer for the home unless there was a genuine work use for it. Adults here were not computer enthusiasts in the early-mid 80s. I found it bewildering. Yes there were some lucky kids who had an 800+810 but not many. Apples and TRS80's and later 80's PC's yes more so.. I never knew an adult who bought an A8 for their use. Unheard of here. So yes it IS quite surprising to me. Mildly different culture here. The only 8bit computer that was widely accepted for professional use were the early PC's. There is a big tech corridor here, too with the Dulles/Tysons area, but that was just getting going in the mid-80s. What hardware did Atari make for the 8bits for cinematic, production, sound or graphics? What other prominent scripts were written on it? I used my atari in college (1988ish). Paperclip and a dot matrix. Worked fine. 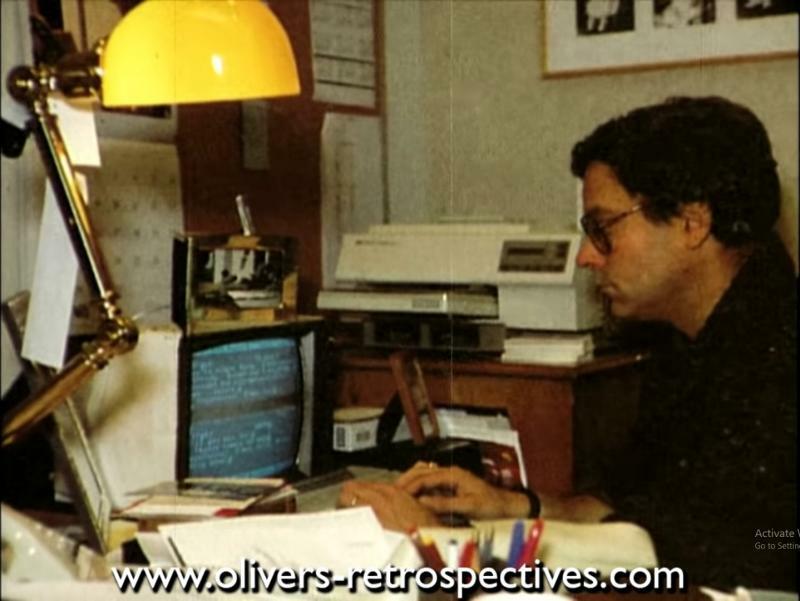 The guy who writes Game of Thrones still does it on Wordstar under DOS to avoid distraction, so using an A8 in 1987 if you were familiar with it wouldn't seem that "off" or "rare". I think my father still had a CP/M machine as his main text processor in his law practice back then. To the computer literate who are the majority her I'd assume, switching word processors isn't a big thing as they work all alike, at least in our eyes. That's not the case for everyone even with point and click applications and secretaries, etc. usually complain when they have to switch to something else, one of the reasons M*soft can still sell Word although there are numerous free alternatives around. Back then switching word processors would have required learning all new commands and even usage concepts, so someone not too tech savvy would have avoided it if possible. Same here, did my HNC in Electronics and Computer Engineering on my Atari 800 and Atari Writer in the early 80's. Used the 800 as my course project and built a Centronics printer interface using joystick ports 3 & 4. SF author Jerry Pournelle was a micro enthusiast and early adopter of word processing. In his regular BYTE column he wrote about his experiences and he reviewed much hardware and software. He encouraged many writing colleagues to get into it. Edited by ClausB, Sun Mar 3, 2019 6:42 AM. It looks like he is using the Paperclip word processor from what I see on the screen, specifically the status lines at the top and bottom. Edited by jnharmon, Sun Mar 3, 2019 8:25 AM. I love that ANTIC mode 3 with descenders. Very underutilized display mode. I remember typing in SpeedScript from some magazine BITD, saving it to disk, and then using that for many years as my word processor. It too had the descenders. At the time I worked for a industrial refrigeration company in the R&D lab and used it all the time to write up my weekly reports. I used both AtariWriter and a pirated (no dongle required) version of PaperClip as a high school kid circa 1984-1986. I preferred the obvious power and flexibility of PaperClip but in the pre-internet days, finding a comprehensive manual for a bit of pirated warez was not terribly easy, lol. A year later I got a copy from SenorRossie which did work and it's a pretty powerful wordprocessor. That's why I use it in the U1MB/Incognito firmware. Love it.